This weekend was the wandering revisit of the projects of old. I managed to finish up the back of butterfly. The shot on the top is unblocked, the shot on the bottom is wet and blocking. this is my first time blocking lace, and it is pretty impressive how much better it looks. 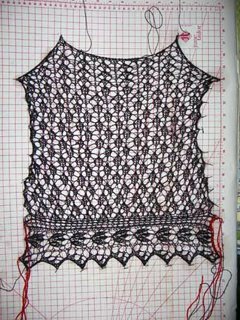 i finished the back but did not have the stamina to start the front. 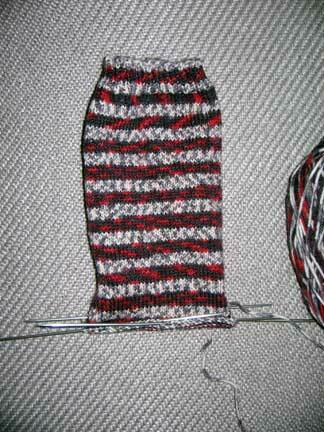 my secret project requires counting, and the canada sock requires following a chart. 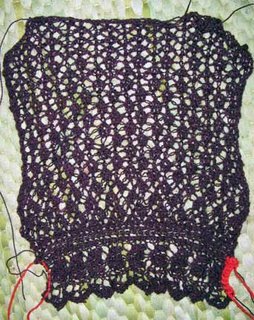 i needed a mindless project, because i watched Crash and The Station Agent, and then Desperate Housewives and Grey's Anatomy. 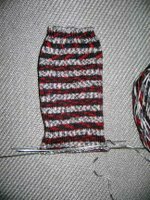 so i cast on for a pair of lionbrand magic stripes socks. i completed the 8" cuff last night. i plan to make these a bit more fun than normal...but i won't tell you how yet. wait and see. Looks good sara! I am impressed... 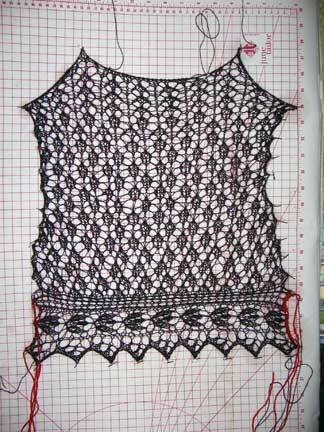 I have yet to block anything, and I am not big on knitting lace... but whatever. You should be getting a postcard soon, and maybe a pkg... hope you like your gifts!